I'm thinking about fitting a new motor to my older Warn M8274 high mount winch, do I need to change the pinion gear? Some of the old Warn high mounts have a keyway pinion gear, usually those with the 2.1HP Prestolite motors. The Bosch motor [MRV-B-4] 2.5HP was fitted from around 1987 and this motor has the splined armature shaft. To convert your high mount to the newer motors, the splined pinion gear part number 15879 is required. The 4.6 and 6hp motors all use the splined pinion gear. Changing the pinion gear is easy. 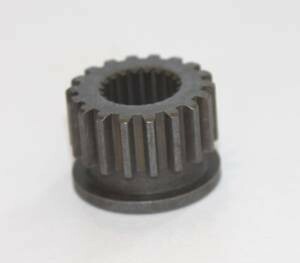 We always have the splined pinion gear in stock. The image below shows the splined pinion gear.